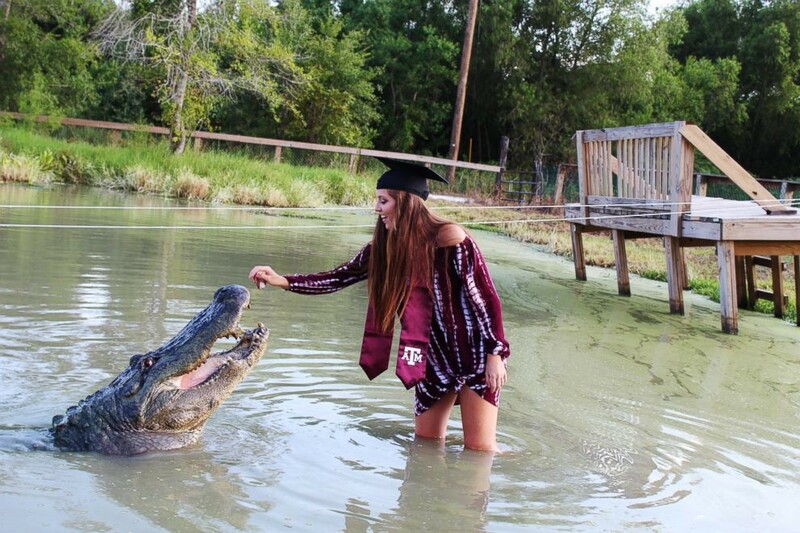 A fearless Texas A&M senior posed with a alligator for her jaw-dropping graduation photoshoot after she developed a one-of-a-kind bond with the reptile during her summer internship at Gator Country Rescue in Beaumont, Texas. Speaking about her experience with the nearly 14-foot long and 1,000-pound alligator, Makenzie Noland said: "I am not scared for my life out here, I know I am in very good hands." "I am very happy to work with Tex [the alligator] every single day so I wanted him to be a part of this special moment," she explained. Despite the intimidating look on the gargantuan reptile, Noland said he's a gentle giant. "I know on a moment's notice it can turn bad but he doesn't want to hurt us, he tries to watch our backs. Whenever we go into any other alligator's pond he's up there looking at us, making sure we're OK," Noland said.